It's that time again where millions watch in awe as the best athletes in the world compete in tests of strength, endurance, and skill. As one of the eagerly watched signs that the Olympics are approaching is the ceremonial journey of the Olympic Torch. Thousands of people around the world help carry the Olympic flame from Olympia, Greece, to a new host city before the Summer or Winter Olympic Games. And among those thousands are Latter-day Saints. In the days leading up to the opening ceremonies of the 2002 Winter Olympics in Salt Lake City, Utah, Elder Robert D. Hales carried the Olympic flame up the steps of the Church Administration Building. There, he passed it off to President Gordon B. Hinckley, who held it high as he gave a brief salute to the athletes, organizers, state of Utah, the United States, and the world. He then passed the flame on to cancer survivor and member of the Quorum of the Twelve Neal A. Maxwell. But the Prophet and Elders Hales and Maxwell weren't the first Latter-day Saint to hold the Olympic flame. In honor of the 2016 Olympics in Rio, Brazil, we took a peek into the history of Mormons and the Olympic torch. Though hundreds of Latter-day Saints have held the special flame, here is just a sample of the incredible stories of those who have held the Olympic torch. For a longer list, check out the following from LDS Church News: "Torchbearers from All Walks of Life," "Torchbearers," "Olympic Torch Arrives in Salt Lake City," Torchbearers Part 2," "Olympic Torchbearers," "Olympic Torchbearers Part 2," and "Olympic Torchbearers Part 3." "I can't help but get a little nostalgic each time the Olympics roll around," he shared. "16 years ago, I had the great privilege of passing the Olympic torch and performing in the opening ceremony of the 2002 Salt Lake City Winter Olympics. "Has anyone else been counting down the days until the #pyeongchang2018 games begin?" When Ann Romney was nominated by her husband, Mitt, to carry the torch, she couldn't really run due to her battle with Multiple Sclerosis. After her nomination, however, she began training and preparing for the event. "The first thought that came into my mind when I was handed the Olympic torch on a residential street in East Salt Lake City was probably the same thought as the almost 12,000 people who had carried it before me: Don’t drop it! "I grasped it tightly in my right hand, held it up triumphantly, and began jogging. I was so psyched up for that moment that I took right off—leaving Mitt, Josh, and his wife Jen, standing there dumbfounded. . . When nominations began for the Olympic torchbearers that would trace a path to Salt Lake City, Utah, Jim Johnson's name was submitted—but not by anyone he knew personally. While hiking in the Grand Canyon, Johnson came across a mother and daughter whom he recognized wouldn't be able to make it out of the canyon before dark. So he helped carry their packs and made sure they made it safely out before the light disappeared. In return for his help, the mother and daughter nominated Johnson to carry the flame. At 103 years old, George E. Freestone was the oldest torchbearer in the 2002 torch relay. He was also recognized as the oldest living Boy Scout in America, having joined one of the first two troops in the U.S. when he was just 12. Freestone passed away in 2003 at 104. H. Smith Shumway led his infantry platoon onto Omaha Beach on D-Day in June 1944. Almost two months later, he was injured in an explosion and lost both of his eyes. It took several years for Brother Shumway to heal and be rehabilitated. He married Sarah Bagley in the Salt Lake Temple in 1948 and became a leading force behind helping blind people in the United States. Shumway carried the torch in Cheyenne, Wyoming, in January of 2002. He passed away at 89 in 2011. Born in Heber City, Utah, in 1902, Perris S. Jensen had the unique opportunity to carry the Olympic torch and flame at the exact time he turned 100 years old. Brother Jensen dropped out of school when he was 16, but through diligent personal study, he passed all the bar exams to practice law. 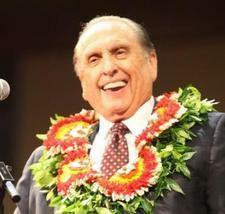 He still pursued a college degree later in life, however, graduating from BYU in his mid-80s. Jensen passed away in 2004 at age 102.